The fate of refugees is especially pertinent today, even though the war in Syria has been going on for years. As the United States government debates whether to refuse access to refugees fleeing Syrian and other war zones, and as European countries worry about security and other refugee-related concerns, there are questions on everyone’s minds: Who are the refugees? What challenges do they face? And perhaps most importantly, how can we help them? Fleming is the chief spokesperson for the United Nations High Commissioner for Refugees (UNHCR). She is not a writer of fiction, but what she has written feels very much like a fantastic story, filled with all the ups and downs of a complete plot and the strong characters readers will love. 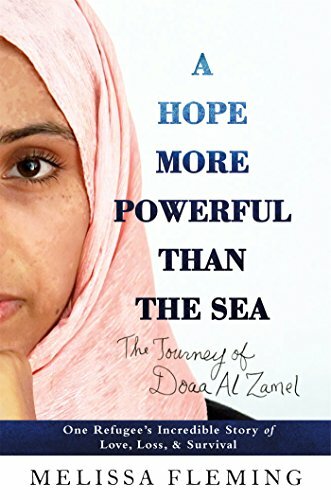 This is the story of Doaa al-Zamel, a young Syrian woman who escapes against all odds from Syria to Egypt, and finally to Europe, losing almost everything in the process. More than Doaa, this is the story of all the refugees—those who successfully escaped bombs and killers, but also those who have died, their bodies buried under rubble or in the seabed. From Doaa we can learn about the immediacy of the refugee crisis, as countries and even governments fail to provide safety and a sense of respect to those fleeing wars. Doaa is born in a small city in Syria. As a young woman she witnesses the excitement of a nation protesting, then fighting against a dictatorship. She is part of the demonstrations, believing that she is doing whatever she can to save her country and bring democracy to it. Unfortunately, whereas similar protests topple the governments of Tunisia, Egypt and others, Syria is different. The people are not strong enough, and the dictator Assad is too strong. What results is a horrific use of force by Assad against his own people. Doaa, her family, friends, and neighbors are caught in the crossfires. Doaa sees people around her die or run away, trying to find security elsewhere. Finally, after years of protesting, they find it impossible to survive the bombs and armies any longer and escape to Egypt. For a while, the people of Egypt welcome Syrian refugees. The two countries have ethnic ties, and the government of Morsi is positively inclined toward them. But then a political upheaval occurs in Egypt as well. Morsi is removed by al-Sisi, and Syrian refugees find themselves overstaying their welcome. Doaa and her family are already living in poverty in Egypt, relying on the kindness of Egyptians making do with backbreaking work and donations. She wants desperately to return to Syria, but there is no hope there any longer. Every day she receives word of more neighborhoods being bombed, more friends dying needlessly. At the same time, the winds of goodwill in Egypt have shifted as well with the change in government, and Doaa finds herself in danger again. Her fiancé Bassem has friends in Europe. They have escaped earlier, and tell stories of safety, of jobs and education. To the couple, life in Sweden, Greece, and Germany seems safer. Despite the rumors of capsizing boats, they decide to pay smugglers to take them across the ocean to Europe. Their journey is a horrific one, and it is enough to say that readers will shudder to read about the trials hundreds of refugees endure. Why is Fleming’s book so important today? America and Europe are seeing a changing tide of public sentiment against refugees, similar to what Doaa saw in Egypt a few years ago. With political rhetoric comes fear mongering and hateful bigotry, and people begin to blame poor refugees as the reason for all their problems. At the end of the day, we learn empathy from accounts of those who have lived their worst nightmares, like Doaa and Bassem and millions others like them. When we watch the news, these stories don’t make sufficient impact on us. The news of overturned boats in the Mediterranean, dead bodies of infants washing ashore, doesn’t have the impact on readers as it should. But stories like Doaa’s, presented in the form of excellent storytelling, thrilling surprises, and powerful characters, do have an impact. This is a must-read book for everyone who is debating the refugee crisis, because it boils the entire war in Syria down to one family, one young woman: Doaa.